Is it necessary to suffer to be a Christian? Have you ever wondered about the reason for your seemingly endless problems? "And when they had preached the gospel to that city, and had taught many, they returned again to Lystra, and to Iconium, and Antioch, Confirming the souls of the disciples, and exhorting them to continue in the faith, and that we must through much tribulation enter into the kingdom of God" (Acts 14:21-22). The apostles Paul and Barnabas taught that tribulation is necessary in the Christian life! It is a vital prerequisite to entering the Kingdom of God. Why? Why, if God is part of your life — if God is directing your life — must you as a Christian suffer problems, trials or traumas? You have probably puzzled, at one time or another, over how or even why you should "count it all joy when ye fall into divers temptations" (Jas. 1:2). How can you honestly approach personal difficulty as a joy? Why does God expect this of you? The apostle Peter wrote, " Beloved, think it not strange concerning the fiery trial which is to try you, as though some strange thing happened unto you" (I Pet. 4:12). Why? It seems only natural to wonder about the necessity of certain problems when they arise in your life. It's hard to have difficulties and not question the reason for them. Is mankind doomed to have problems without knowing why they happen? Often Christians look upon problems in their lives as a sign of God's displeasure or correction. In some instances, this may well be the case. God does indeed correct and chasten His begotten sons (Heb. 12:6-8). But that isn't the only reason — or even the primary reason — for some trials in our lives. At one point in his work, the apostle Paul was stoned by a group of people and dragged outside the city, assumed to be dead (Acts 14:19-22). Was Paul in a bad attitude? Did he need correction for some sin? Why did he have to have this trial? Read through the early part of the chapter. Paul, by the power of God, had just performed a miraculous healing (verses 9-10). He was energetically preaching the Gospel and teaching the truth to the people; his teaching was accompanied by signs and wonders (verse 3). God must have been pleased with what Paul was doing. There is no indication that Paul was in a bad attitude or had failed to repent of some sin. But being pelted by stones until he was unconscious was certainly a trial! Later, Paul even wrote the Corinthians that he would be better off if his physical life were over (II Cor. 5:8). The real trial in this case was undoubtedly more for those members of the Church who had heard Paul's message and then seen him stoned and left for dead. What must have gone through their minds when they saw this man, who had been performing miracles among them, apparently killed? They might have thought God had deserted them. They perhaps felt betrayed — at least bewildered. They probably wondered how such a thing could happen to a Christian. But then imagine the inspiration the brethren must have felt when Paul got up and even went back into the city in spite of what had just happened! It was just after this incident that Paul exhorted the people to have faith and explained "that we must through much tribulation enter into the kingdom of God" (Acts 14:22). Paul used the experience he had just gone through to encourage the people and also instruct them that there would be trials in the Christian life. In effect, he said we must have trials. But why is this true? At His final Passover on earth, Jesus Christ changed the symbols of the observance (I Cor. 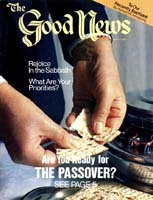 11:23-25). In making these changes Christ said He had set the example for us, and that we should diligently follow His example. This is true in every facet of Christian life. I Corinthians 15:3 says, "Christ died for our sins according to the scriptures." Christ unselfishly gave His life so that mankind might have salvation. He was the perfect example, during His life, as a living sacrifice and, with His death, as a total sacrifice. He was tempted to sin and yet always controlled His desires and actions in order to qualify as our Savior. It wasn't an easy task. Christ was a vibrant, powerful, healthy man. His emotions, uncontrolled, could have naturally led him to strike out in anger, to drink too much, to respond to human drives — to satisfy the pulls of the flesh. Christ felt those desires but never sinned. His effort had to be a tremendous one. It hurt Christ physically when He was beaten and crucified. His perfectly healthy body had never been abused. He felt deeply, strongly, agonizingly the insults and punishment heaped upon Him. It hurt to have a crown of thorns jammed down on His head. He suffered greatly. The desire to retaliate must have stirred within Him, but He accepted the totally unjustified actions in the spirit of the sacrificial Lamb He was, and willingly gave His life for us. Christ, the perfect example, had to suffer in order to perfect His character and remain qualified to become the Savior of mankind. It hurt to resist the very real temptations that came upon Him. Hebrews 5:8-9 says: "Yet learned he obedience by the things which he suffered; And being made perfect, he became the author of eternal salvation unto all them that obey him." If Christ needed to suffer to perfect His character, can His servants expect any less? "Wherein ye greatly rejoice, though now for a season, if need be, ye are in heaviness through manifold temptations." Stop there. Notice that the problems that confront you are "for a season." Generally, they won't last over an extended period of time. But notice the next words, "if need be." In other words, at times it is necessary to experience "manifold" (many or various) temptations, trials or problems. Our faith needs to be tried in order to be strengthened. Just as with Jesus, the end result of our faith in God is salvation. Trials strengthen faith, which produces salvation. Moses explained the reason for Israel's trials to the people by saying: "And thou shalt remember all the way which the Lord thy God led thee these forty years in the wilderness, to humble thee, and to prove thee, to know what was in thine heart, whether thou wouldest keep his commandments, or no" (Deut. 8:2). The apostles Paul and Barnabas taught that tribulation is necessary in the Christian life! It is a vital prerequisite to entering the Kingdom of God.... Why, if God is part of your life... must you as a Christian suffer problems, trials or traumas? reports of the size of the inhabitants and the dangers of the land. The 'Israelites, out of fear, refused to trust God to provide for them. Therefore God forced them to spend the next 40 years wandering in a wilderness that offered no obvious way to support life. Notice verses 3 and 4. The Israelites were allowed to go hungry for a short time, after which God fed them in a manner they could not have anticipated. Their clothing didn't wear out. Their feet didn't swell in spite of all the hard walking in the heat of the desert. God proved to Israel that He not only could but would provide the nation's every need even when it seemed impossible. Fortunately, we today aren't always required to suffer the trials ourselves. It is possible to learn from the experiences of others, so that we don't have to learn lessons the hard way. I Corinthians 10:6-11 explains how these things happened to Israel as examples for us, so we wouldn't make the same mistakes. Many trials are very difficult. I Peter 4:12 speaks of the "fiery trial" that can come upon us. Fire is respected by everyone and feared by many. A fiery trial is not easy for a Christian to endure, and may well be one where he has difficulty relying upon God for the solution. It is easy to think that no good can result from a particularly difficult circumstance. Perhaps that was Abraham's initial thought when he was told by God to sacrifice his only son, Isaac (Gen. 22:2). Then Abraham realized God had promised the son, given the son to him and promised descendants through the son. It was indeed a fiery trial for Abraham, and yet one that he passed with flying colors. He knew with complete confidence — faith that God would provide the answer. He proved his faith in God by his actions. And Christ said that Abraham has, through his faith in God, attained salvation, even though he hasn't yet received it (Matt. 8:11). Another important aspect of a trial is that it develops patience, an admirable virtue but one that is difficult to express. We want action now. As a result, we often attempt to sidestep the problem to receive the immediate relief we desire. But sidestepping the problem deprives us of one of the great benefits produced by the trial. "And not only so, but we glory in tribulations also: knowing that tribulation worketh patience; And patience, experience [some translations render this word character]; and experience, hope: And hope maketh not ashamed; because the love of God is shed abroad in our hearts by the Holy Ghost which is given unto us" (Rom. 5:3-5). Patiently continuing through a trial, with faith in God, produces godlike character. Godlike character is the one thing God doesn't create. An individual must come to understand the difference between right (obedience to God) and wrong (disobedience to God), and then choose right regardless of the circumstance, to develop true godly character. Then the person may be required to wait patiently for God to do His part. All trials are not necessarily times of personal hardship or pain. There are the intangible trials, which at times seem even more difficult for us to master. These trials deal with our attitudes. Learning to control our minds and thoughts is one of our most difficult battles. Our attitudes are deep down inside our hearts and minds. Peter addressed the problem directly: "Servants, be subject to your masters with all fear; not only to the good and gentle, but also to the froward" (I Pet. 2:18). Here the word forward means "unreasonable." Christians are to willingly and energetically serve their bosses. They are to follow their superiors' instructions, as long as they don't involve disobedience to God, even though the instructions may seem unreasonable. A Christian should work just as hard for a penny-pinching, inconsiderate tightwad who will never give him time off as he would for a gentle, considerate, generous boss who tries to understand his needs. Our natural reaction is to rebel, talk back or slow our production. It is hard to see why we should make extra effort when the boss is unkind or inconsiderate of his employees. But we are still required to practice our Christianity. The boss may never know our attitudes. But God knows what is in our hearts. It is hard, to maintain right attitudes when we feel we have been wronged, or when the one to whom we are responsible is acting contrary to our wishes or well-being. But remember this: The Church — all of us as a unit — is to become the Bride of Jesus Christ. All of us, whether male or female, will become part of the Wife of Christ. Therefore the instruction in Ephesians 5:22-24 applies directly to each of us: "Wives, submit yourselves unto your own husbands, as unto the Lord ... Therefore as the church is subject unto Christ, so let the wives be to their own husbands in everything." We often feel that to be subject or to submit requires nothing more than a docile, passive lack of action. Rarely do we look upon submission as an active, energetic way to serve God. It is difficult to submit. It requires conscious thought and effort to submit to God. We must conquer our thoughts and deliberately control our actions. We have to think about how we can make our part in the family, on the job or in the Church more supportive of God's way. On occasion we may have to force ourselves to pray, fast or study in order to submit to God's way. At other times we may have to refuse to think wrong thoughts or force ourselves to think good ones. We may have to apply our minds to see how we can make the instruction we have been given work. Anyone can sit passively and do nothing. It requires effort to willingly, honestly submit to a higher authority in our lives. Jesus Christ was the supreme example. "For even hereunto were ye called: because Christ also suffered for us, leaving us an example, that ye should follow his steps: Who did no sin, neither was guile found in his mouth: Who, when he was reviled, reviled not again; when he suffered, he threatened not; but committed himself to him that judgeth righteously" (I Pet. 2:21-23). When Christ was being unjustly accused, beaten and then crucified, our supreme example didn't answer back, threaten or take things into His own hands. He mentioned that He could call for 12 legions of angels to help Him, but He didn't. He didn't tell His tormentors that He would get even when He returned to the earth as its Ruler. He left it all in God's hands. How hard it is to follow His example and submit ourselves to the will of God! Yet trials come to help us better live our lives in faith to our Creator. "Blessed is the man that endureth temptation: for when he is tried, he shall receive the crown of life, which the Lord hath promised to them that love Him" (Jas. 1:1 2). How can you be happy when circumstances around you tell you to be sad? Why should you "count it all joy" when you are tried? Because the trial of your faith can produce the joyful fruit of salvation — you can become a very Son of God.